NaClhv: How is God related to all other fields of study? (Ask to the whole group) Does anyone know what the Shema is? It begins: "Hear, O Israel, the LORD our God, the LORD is one. (Deut. 6.4)"
(Have the students ask one another in small groups) What is your major, and how did you choose it? On to things like economics, business, art, history, etc. Where is God on this graph? Where is God in academia? Or more generally, Where is God in the sum of all human disciplines? He is exactly where he says he is. (Ask someone to read Rev. 22:13) "I am the Alpha and the Omega, the first and the last, the beginning and the end." All disciplines are based on something more fundamental. 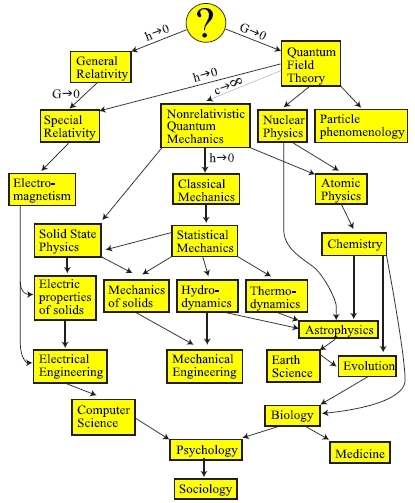 Chemistry is based on physics, which is in turn based on mathematics, for example. If we trace this back, and ask "what is the most fundamental subject? ", we probably come to philosophy, by human reckoning. After all, it's not a coincidence that you nearly always get to philosophy by clicking on the trail of first links in Wikipedia articles. But what lies behind philosophy? All true philosophy is based on God. Thus, God is the "alpha", the beginning of all things. When we move in the other direction - when we move towards more comprehensive subjects which cover more complex things, we probably arrive at something like big history as the most comprehensive subject, by human reckoning. But what lies beyond history? All that happens in history is for the glory of God, and the acts of God encompass the entirety of all that happens in the universe. Thus, God is the "omega", the end of all things. Now, some of you may be thinking, "Well, that's great, but I study something in the middle. Are we saying that God isn't in anything in between the two extremes?" God IS found in the middle, because a fundamental truth will be found in everything else that's built on it. Let's take mathematics as an example of a relatively "foundational" discipline, which everyone is at least a little familiar with. God is like that, except he's even more foundational than math. So God, being the foundation on which everything else is built, comes up in all the disciplines. Physics, in the development of weaponry such as the V-2 rockets, the radar, or the atomic bomb. Psychology, in the study of the state of mind of soldiers, especially in examples of people like kamikaze pilots or the participants of Omaha beach landing. Economics, in the relative industrial output of the United States which gave it an insurmountable long-term advantage in the war, and its relation to the Great Depression beforehand. Ethics, in the debate over the appropriateness of the atomic bombings, or in the horrible war atrocities that were committed. God is like history - except he's even more comprehensive. So the knowledge of God, being the biggest, most comprehensive thing, includes all the other disciplines. Thus, God is the one which all truths - all the subjects of human study - are based on, and the one which all truths are about. He can therefore be found in any field of study. And that is what (to me, in this context) is meant by "the LORD is one". There isn't a separate god of the sun, a god of nature, a god of mathematics, a god of morality, a god of logic, a god of beauty, a god of art, and a hundred other subjects we can name. There is one God who is above all and in all and through all. What is our response to this? The verses of the Shema go on to describe it (read on with the group). "Hear, O Israel, the LORD our God, the LORD is one. You shall love the LORD your God with all your heart and all your soul and all your mind and all your strength". We are to love God with the entirety of our being, because God the one God over everything. And you are to love the Lord your God in your studies as a part of loving him with our whole being. So, no matter what your field of study is, it is based on God, and it is about God. It says something about God, and God says something about it. Your job, as a Christian who is in your particular field, is to find out what these "something"s are so that you may love God more perfectly. That, then, is the understanding with which you should approach your studies. How do professors and students in your major view the world in approaching their field of study? What leads others in your field to pursue that field? What are their goals in studying your discipline? How do you view the world, and what goals you have in studying your discipline? Work out the practical examples of how you see God in your major. What does your field of study reveal about God? What does God say about your field of study? Thanks for writing this. You've really helped paint in my mind a picture of the bigness or 'breadth' of God as One who fills every avenue the human mind can walk down. if I make my bed in the depths, you are there." I'm grateful that it helped you. This post is not as popular as some of my other posts, but it's one that I feel is one of the more important posts in my blog. I hope you find other things on my blog that helps you understand God! All the subjects are generated from the sociology. All the phenomenon will be find in the deeply study sociology.